In 2008, a sixteen-year-old high school student, Teresa Cheptoo, won a Nobel Prize in the children’s category for her heroic work to fight against female genital mutilation (FGM) in Kenya. She then donated her winnings of one million shillings (approximately US$13,500) to the Kipkomoa Advocacy for Girl Child Program to provide a library and plenty of desks, thus helping and motivating Pokot female students to attain a full education. In her native Kenya, FGM is a largely accepted practice on teen girls of Pokot, who drop out of school and get married, often forcefully, soon after the cut. Teresa has been worked tirelessly for the past several years to teach girls and boys about its negative health, psychological and social consequences for women. 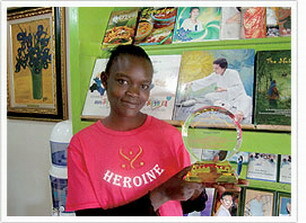 As an off-shoot of the advocacy clubs set up across Kenya by charity World Vision, she established Anti-Female Genital Mutilation/Early Marriage Advocacy Clubs. With the help of teachers and classmates, Teresa has recruited approximately 200 boys and girls in 13 schools to educate the community about the adverse consequences of FGM. Each member of the clubs works to influence at least two girls to say “no” to FGM and early marriage, and to encourage two boys to support the girls’ decision. They also convince their parents, relatives and neighbors to abandon these harmful traditional practices and adopt alternative rites of passage for the girls. We salute you, Teresa, for your heroic actions, selfless love and commitment in helping the girls of Pokot, as well as for being such a dedicated and noble role model. 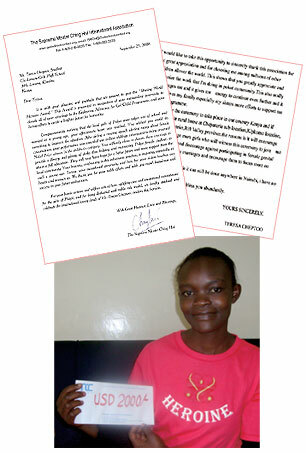 Teresa Cheptoo received a US$2,000 contribution from Master to support her noble work.